The specifics may change, but adult worries about young people continue on. Teaching children effectively requires understanding them, but as times change, educators are left to wonder whether children are changing as well. And, if societal changes affect what young people need, then how should schools respond? Blanchard observed that the increasingly swift societal and technological changes were leading to a longer period of adolescence, as labor laws and union regulations kept young people out of the workplace and compulsory education kept them in school. This parental ambition created a sense of pressure, as children were pushed into vocations and roles they were not suited for. Better, Blanchard attested, to listen to young people and try to understand their beliefs and desires. Blanchard’s ideas echo across the decades, as Kappan writers have tried to understand both children themselves and how to prepare those children for life in a constantly changing world. What’s wrong with these kids today? Yet, Rafferty was willing to acknowledge that schools may bear some of the blame for these students’ behavior by, for example, “never insist[ing] upon their mastering anything which required discipline to overcome” (p. 58). However, whatever the root causes, to Rafferty these “slobs” were beyond help from the schools and should, therefore, be removed. Sol Gordon took a more measured approach in his February 1966 article, “Education and the impulse life of the child.” Gordon’s focus was on younger children than Rafferty’s “slobs,” and much of his criticism is focused on parents and teachers. But his criticism comes with an acknowledgment that it’s difficult for adults to know how to best meet children’s needs because “parents have become paralyzed by an overabundance of advice from magazines, from their own mothers and fathers, and from neighbors” (p. 310). His advice? Listen to children, reassure them, and address their behavior instead of communicating shock or disdain at their expressed thoughts. Some authors have echoed Blanchard from 1938 in pointing out that adults and children are becoming too isolated from one another, creating problems not just in understanding between generations but in young people’s ability to prepare for adult life. For instance, in December 1972, James Coleman (“How do the young become adults?”) examined how families and workplaces had evolved so that children no longer learned their future occupations (whether at a workplace or at home) from their parents. And school-based learning offered fewer opportunities for “experiential learning” than home-based learning did. Wagner believed that the problem went beyond inappropriate career preparation, writing that “it is increasingly clear that the traditional methods of education and attitudes toward work and leisure in our culture have created serious emotional side effects for many students” (p. 543). It seemed young people of the 1980s were not being encouraged to see themselves as connected to the wider world. In the 1970s and ’80s, Kappan authors began expressing serious concerns about young people’s mental and emotional health, often in articles about the increasing suicide rate. In April 1976, Donald Smith sounded the alarm in “Adolescent suicide: A problem for teachers?” in which he noted the growing number of suicide attempts and considered possible causes and warning signs. Two years later, in January 1978, Edward Wynne (“Behind the discipline problem: Youth suicide as a measure of alienation”) linked suicide and other problems (such as homicide deaths, teen pregnancy, drug and alcohol use, and sexually transmitted diseases) with the increasing alienation young people were experiencing. What are the causes of this disconnection? In February 1986, Urie Bronfenbrenner (“Alienation and the four worlds of childhood”) followed the lead of past authors and looked at overall social trends, such as the growth of dual-income families. It is possible for children in such families to do well, but, according to Bronfenbrenner, “unlike most other industrialized nations, the U.S. has yet to introduce the kinds of policies and practices that make work life and family life compatible” (p. 431). Through the 1980s and ’90s, authors continued to sound the alarm about various aspects of children’s lives, including obesity, prenatal drug exposure, lead exposure, violence, homelessness, HIV, and fetal alcohol syndrome. The September 1992 issue, in fact, included a special section on “Children at risk,” which covered the various crises afflicting young people and, by extension, their schools. Behind all of the conversations about the problems young people experience lurks the same question that Max Rafferty identified back in 1958. To what degree are adults, rather than children, the source of those problems? And decades of articles about adult concern for youth problems raises an additional question: Is it possible that the kids (of the 1950s, ’60s, ’70s, and so on, up to and including 2019) are not so different from kids of the past? Many in Astroth’s audience were probably of the same generation as Rafferty’s “slobs,” Gordon’s impulsive children, and Wagner’s disenchanted adolescents. Of course, none of these authors were necessarily saying that all young people were plagued by various forms of alienation, but Astroth worried that “the notion of ‘youth at risk’ has become a lens through which we view all young people, so that today adolescence is seen as some incurable social disease” (p. 412). Such a lens was preventing adults from getting an accurate view of the problems kids face and the help they need. The Ozzie-and-Harriet childhood that family values advocates promoted was mostly a myth, according to Coontz, who further argued that good schools for kids and steady, well-paying jobs for adults would do more to elevate the prospects of young people than shaming families ever could. The children of every generation face their own challenges, but adults themselves are responsible for cultivating a world that enables them to cope with those challenges. It is up to us. Citation: Preston, T. (2019). 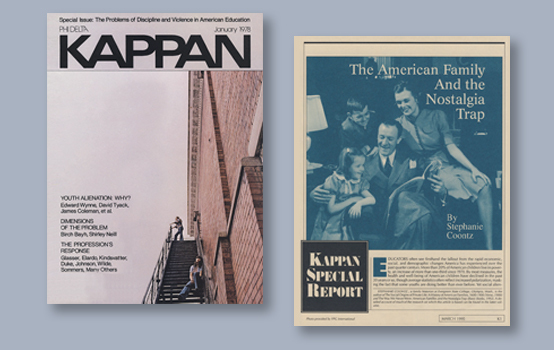 A look back: Kappan authors on children and youth. Phi Delta Kappan, 100 (7), 5-7.